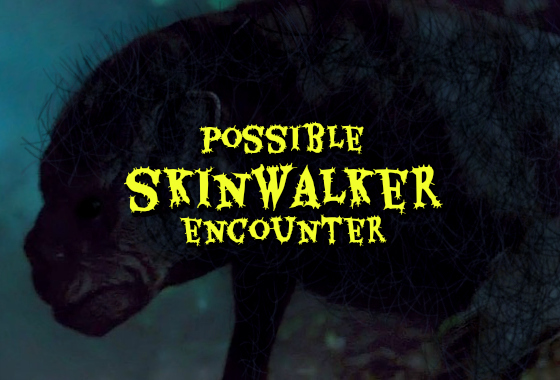 “I haven't really heard many stories of Native American skinwalkers, so I thought I would share my experience. My sighting happened in the summer of 2007 when I was working the night shift at a surface coal mining facility. I used to drive a coal hauling truck which was pretty huge and required a series of steps just to climb into the cab. I just completed my pre-shift inspection and I noticed that my radiator was leaking. I called my supervisor and he asked me to drive the truck to the shop. The shop was about six miles to the north from the coal pits which was located in a remote part of the Navajo Reservation. I drove the truck to the shop, called the shop foreman and he radio requested that I park the truck at the south side of the shop. I parked the truck and I lowered the ladder and I descended the ladder. I wanted to see how much fluid was left in the radiator. So I lowered the rear ladder and climbed into the engine compartment. The leak was pretty bad so I climbed down the ladder and that is when I saw the skinwalker. It was the weirdest thing that I've ever seen. I seen it was about two hundred feet from me. It was walking around the other mining equipment. It looked like a huge dog. The fur was beige in color and it walked on all four legs. The coat was pretty patchy, missing clumps of fur and bald spots. It smelled really bad like a rotting roadside corpse. It had seen me and started to walk towards me. I pulled out my flashlight and I noticed that the dog's eyes did not reflect any light. Its eyes were black and lifeless. Its head made a bobbing motion. And it was walking towards me. Its head was huge. It looked like a Bull Mastiff which was my first impression. I initially thought, this is a huge dog and it's probably sick and hungry. It got to within twenty feet of me and I pulled out my pocket knife. I was ready to defend myself if this thing wanted to attack. I started to walk carefully towards the shop and I kept my eyes on the creature. It followed me, paralleled my every step. Its walk wasn't natural and fluid like a normal dog. It moved in an unnatural way. I walked about a hundred and fifty yards to the shop and it kept its distance. I finally got to the shop and the skinwalker stopped at the driveway of the shop bay doors. I went inside and I told the shop foreman and to come see this weird looking dog. And we both went outside to see it walk away from the shop and turn around the corner of the building. A few seconds later, my supervisor drove around that very corner and I asked him if he had seen that weird looking animal. He said that he didn't see it. I told him that he had to have seen it. He drove in the very direction that it walked off towards. I described what I had seen and my supervisor said that it was a skinwalker. That night, my supervisor made me ride with him throughout the rest of the night shift. He opened me up to a world and told me of his experiences while he worked at the mine. I haven't had anymore experiences since that encounter but I've seen mysterious lights around the mining area that didn't make any noises."